Should Nigeria regulate the social media? This the one major determination that the March 7, 2016 public hearing on the Frivolous Petitions Bill – also known as the Social Media Bill – aimed to make. The Senate Committee on Judiciary, Human Rights and Legal Matters conducted the public hearing with a view to soliciting stakeholders’ views of the propriety of regulating social media use in Nigeria. 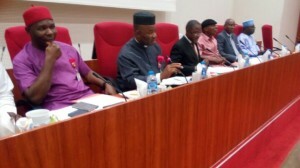 The public session chaired by Senators Victor Akpabio, James Manager, Olajide Omororahre and two others, featured presentations from several stakeholders, including government departments such as the Nigeria Law Reform Commission (NLRC), National Human Rights Commission (NHRC), Federal Ministry of Justice (FMJ), and a host of civil society organizations. Spaces for Change’s members – Uko Ekerete Akpanuko and Emmanuel Onyekachi – participated in the session, where they made strong representations to parliamentarians regarding the proposed bill’s unsuitability to Nigeria’s democratic climate. The Social Media Bill has been described as a “dangerous bill that threatens free expression online.” Despite the public outrage that greeted the bill, especially from millions of Nigerians using the social media for deepening civic and and democratic engagement, it has passed the 1st and 2nd reading and presently at the committee stage where a public hearing is statutorily required to feel the pulse of the public about its provisions. In his keynote address, the Senate President, represented by Senator Akpabio reiterated that the Nigerian legislature does not intend to gag anybody. He, however, maintains the view that there is need for the regulation of the social media. – that time limitations should be included. This means a time limit of 6 months should be given for complaints, and those made outside 6 months timeline should be disregarded. – that such complaints should be formally made etc. – that the bill is not needed as there are other laws that have covered the field already eg the Cyber Crime Act, the Electoral Act, the Sedition and Libels Act etc. – that the bill should be treated as being frivolous! The Federal Ministry of Justice represented by Patrick Oyong, aligned with the position of the NLRC. The National Human Rights Commission also toed the same path. Agreeing totally with the submissions and comprehensive positions of the NLRC, NHRC and the Federal Ministry of Justice, Spaces for Change’s Uko Ekerete Akpanuko submitted that the bill is unconstitutional and contravenes the African Charter on Human and Peoples’ Rights. There are other existing legislations that provide more effective mechanisms for redressing violations that may result from social media activities. They include the Evidence Act, the Criminal and the Penal Codes. Not only that, certain provisions of the Social Media Bill contradict the provisions of the Whistle Blowers Act which empowers and protects citizens that expose alleged wrongdoing in government bodies. – no government department or security agency investigates crimes based on frivolous petitions, statements or complaints. – that the bill by its Sec 3(4) seeks to read or predetermine the minds and intents of social media users in Nigeria. – that it will be practically impossible to monitor millions of accounts across various social media sites as the security agencies do not have such manpower to do so. Assuming 3 million Nigerians use 5 social media sites like Facebook, Twitter, Whatsapp, Instagram, Wechat, that will amount to 5 x 3 million accounts to monitor by security agents. It is doubtful whether Nigeria has such infrastructural and technical capability. This capacity deficit may pave way for specific targeting of marked individuals perceived as strong critics of the status quo. – Finally, the requirement of an affidavit will make it practically impossible to timeously report a crime and will put a lot of stress on the few Commissioner for Oaths in Nigeria that process affidavits. This might compound the backlog of cases already inundating the Nigerian judiciary. PreviousPrevious post:S4C director named 2016 Desmond Tutu FellowNextNext post:Who Benefits from Free Trade Zones?